Malbork Castle, also known as the Castle of the Teutonic Order in Malbork is a monastery, built in 1276 by a crusading military order. The medieval brick castle complex is constructed in the unique Teutonic Order style. The Teutonic order was a Catholic religious order of Germany, made up of crusaders known as the Teutonic Knights. The knights named the castle Mary’s Castle (Marienburg), after their patron saint. Malbork is a town in northern Poland, though the castle was built in the 13th century when the region was part of Prussia as a fortified monastery. In 1309, the Grand Master moved to Malbork from Venice, making the Malbork Castle the seat of the Grand Master. At this point, the monastery was expanded. Malbork Castle is now the largest castle in the world in surface area, as well as the largest brick building in Europe. There are three castles on the compound – the High Castle, the Middle Castle, and Lower Castle, as well as various moats and towers. Visitors to the castle can pay an extra fee to climb one of the towers, offering great views of the grounds. The castle has been damaged several times and restored again throughout the 19th and 20th centuries. It was damaged during WWII and then restored again. There are some original parts of the castle left. Restoration efforts have paved the way for conservation practices around the world. The restorations have been used as a way to conserve the techniques for medieval building construction and medieval art, making Malbork Castle a monument to conservation itself. Audio guide tours of the castle are available in several languages, or you can hire a guide to show you around the building to get the most out of your time there. 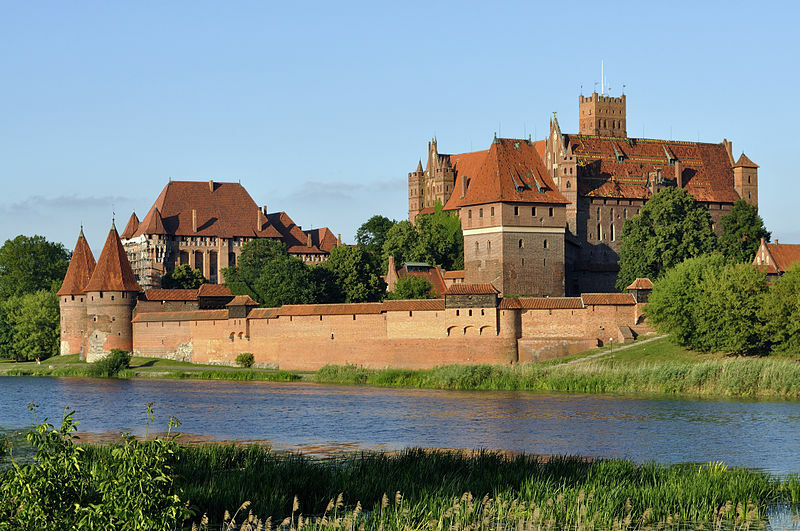 Malbork Castle served as a royal residence for Polish royals from 1466 to 1772. The Swedes occupied the castle from 1626 to 1629, during the Thirty Years’ War, and again during the Deluge from 1656 to 1660. The castle sits on a lot of 52 acres (21 hectares). The castle was once home to 3,000 Teutonic Knights. Half the castle was destroyed during WWII. Malbork is located in northern Poland’s Pomorskie voivodeship (Pomeranian region). The town is situated along the Nogat River, in the Vistula River delta and Baltic Sea. Visitors to Malbork can take the train from Gdansk (about 50 kilometers away) but it is slow, taking about an hour. There are also trains from Krakow or Warsaw, as well as international trains available from Berlin and Kaliningrad. Hiring a guide is a good option, because the guide will often provide transportation to the Malbork Castle.